International collaboration and cooperation are the common mantra for advancing the conservation of migratory shorebirds, and all additional migratory waterbirds, in the EAAF. Those international efforts are oftentimes materialised through agreements. Hence, improving our understanding of the system of those instruments is fundamental to advance our conservation agenda in the flyway, as they represent key pathways for enabling actions. Within this context, a first, and fundamental, step is to survey how many active agreements there are, who participate in them, and what threats they address. That’s precisely what a research team based at the University of Queensland has recently completed, an effort that took just about four years through interviews, attendance at international meetings, and reviewing files. 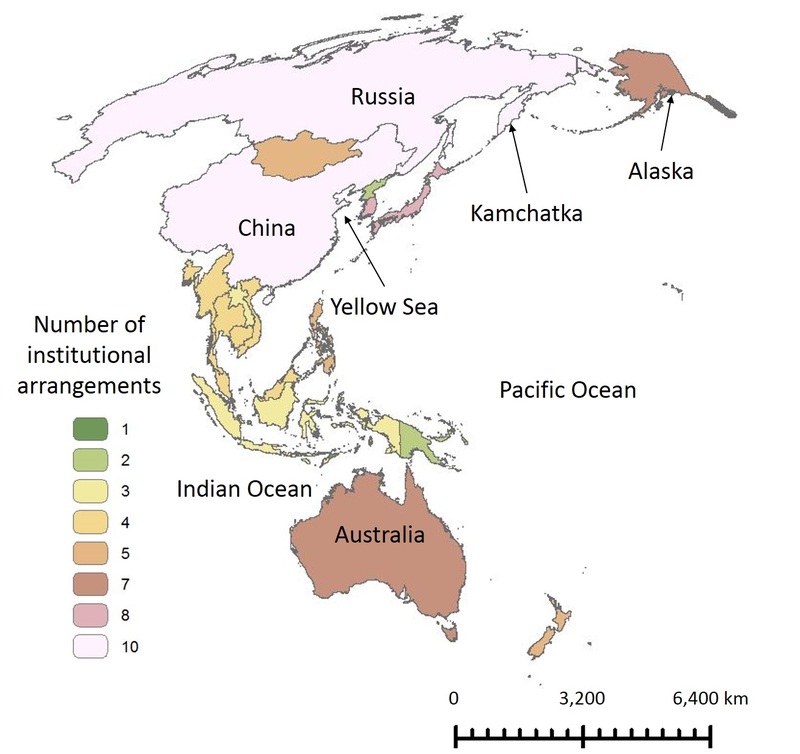 The study is titled “Global environmental governance for conserving migratory shorebirds in the Asia-Pacific” and is forthcoming in the scientific journal Regional Environmental Change. The study discovered that the flyway has a complex of international agreements, and that NGOs and subnational governments have become key players. A total of 28 agreements make up the international framework for conserving migratory shorebirds in the flyway. These agreements have been emerging since the 1970s and participation in them does not present signals of slowing down, with the recent accession of the DPRK to the Ramsar Convention and the EAAFP. The countries with most participation in this framework include China, Russia, Japan, Australia, Republic of Korea, and the USA. Interestingly, the international framework is not an exclusive space for national governments. NGOs have been emerging as signatories to some of these agreements since the mid-2000s, primarily through the establishment of the EAAFP. Likewise, local governments, such as Seocheon County in the Republic of Korea, have been entering additional agreements. This rise in agreements seems to be the result of governance demand in critical areas around the Yellow Sea, where conservation has been highly contested. In sum, national governments remain central to the framework, and NGOs and subnational governments have emerged as pivotal complements. Now the key challenge is to ensure actions are coordinated across agreements, something already underway when looking at, for instance, the relationship between CAFF and the EAAFP. Acknowledgements: The lead author of this study, Eduardo Gallo-Cajiao, is immensely grateful to the many people from around the flyway who supported him during his fieldwork. They know who they are! This research was funded by the Australian Research Council Centre of Excellence for Environmental Decisions, the Australian Government’s Department of the Environment and Energy, an Endeavour Research Fellowship (Australian Government’s Department of Education and Training), a School Research Grant (School of Earth and Environmental Sciences, The University of Queensland), a Professor Allen Keast Research Award (BirdLife Australia), the Australian Research Council Centre of Excellence for Coral Reef Studies, and the High Meadows Foundation. In-kind support was provided by the East Asian-Australasian Flyway Partnership secretariat, Princeton University, Beijing Normal University, Conservation International, and WWF through its country offices in Australia, China, and Japan.